I am a runner. A reasonably good one even. I have been running for the past 8 years or so. In races, I am in the faster middle-field, and I have run my first marathon this year (in just under 4 hours.... sorry guys, had to rub it in again, as I am still so proud of it). I don't think that there is anything like a shortcut in running (at least not while training - that would be cheating yourself, and otherwise it would be blatantly cheating all other runners). I think running comes easy to me, and I can achieve results with less effort and training than others. When I started running, I was still smoking around 15 cigarettes a day and ran my very first 10k race in under 50 minutes. Rest assured, I stopped smoking a long time ago, and these days I run 10k races in close to 45 minutes when the conditions are ideal. So it surely had an effect. But there are welcome and convenient shortcuts in other fields, like in cooking. As a German, I love my breads. Although during these 8 years of being away from Germany and its magnificent breads, I ate less and less over the years (as really good ones are simply not available). But deep from in my heart, I'd always dig into good breads whenever they'd be put in front of me. 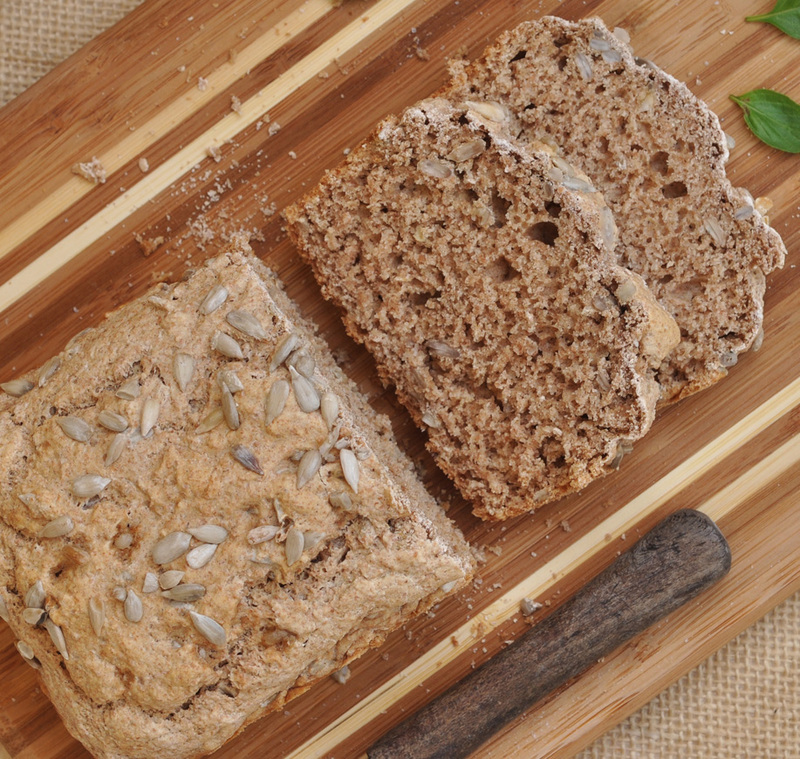 One of my first posts on this blog was my German-Style Bread, a heavy bread full of seeds and whole grains. I experimented with the spice mix, and concocted a mixture that came as close as possible to my ideal bread. I haven't made this bread for ages. My family (much to my discontent) prefers white baguette breads. They usually don't care much about my German-heritage wholegrain bread experiments. So I had abandoned my ventures into the field of wholesome breads until I came across a beer-seasoned quick bread. I remember my husband once mentioning beer-flavored breads. As a general rule, whatever he likes, must be good (because he is so picky....). I assembled all ingredients on the kitchen counter, and it surely feels strange to pull out a can of beer at 9am in the morning. Especially here in Dubai, a Muslim country, with zero-tolerance on the roads. The effects of adding alcoholic ingredients to cooking are still being discussed. As far as I know it is not 100% certain that all alcohol evaporates after a certain time of cooking or a certain temperature. Although I had some driving to do from in the afternoon, I went for it. My old bread spice concoctions went straight overboard when that bread turned out just perfectly spiced. It doesn't taste of beer, it is just perfectly spiced. I enjoyed several slices of my bread for lunch, without feeling tipsy afterwards. Please be aware that this is highly unscientific, but I am just telling you because usually one glass of wine can get me pretty close to singing dirty songs. Enjoy this bread because it's really quick, it's easy to make and it's good with sweet and savory toppings. I love my bean spreads in summer on a slice of bread, topped with some fresh herbs. Filling and refreshing! Good for any BBQs too. Preheat oven to 180C/375F. Lightly grease loaf tin or line with parchment paper. In a large bowl, combine flour, salt, baking powder, sugar and most of the sunflower seeds (keep 1 tablespoon aside). Slowly pour in the beer and mix until just combined. The batter will be thick. 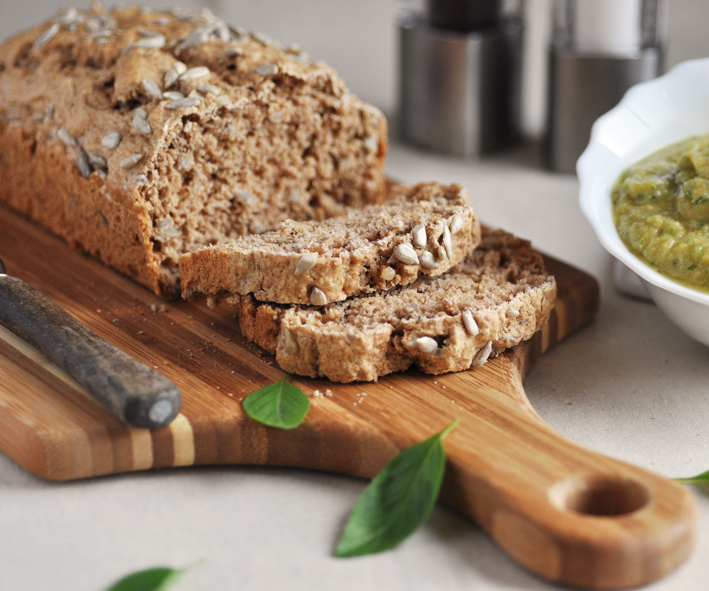 Fill into prepared loaf tin and sprinkle remaining sunflower seeds on top. Bake for about 40 minutes, or until tester comes out clean. Let cool in the tin for 10 minutes. Take out and let cool completely on wire racks.